Marie R. Deveney's principal areas of practice include gift, estate and generation skipping transfer tax planning, probate and trust administration, wills and trust agreements, and retirement distribution planning. She is a member of the American College of Trust and Estate Counsel, the Washtenaw County Bar Association, and the State Bar of Michigan. 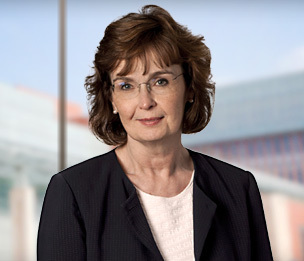 Ms. Deveney is past president of the Washtenaw County Estate Planning Council and formerly chaired the Washtenaw County Bar's Estate Planning Section. She is a former member of the State Bar of Michigan Probate and Estate Planning Section Council. She frequently lectures on estate and retirement distribution planning. Before joining Dykema, Ms. Deveney taught at the University of Michigan School of Law. Prior to that, she clerked for Justice William J. Brennan, Jr. (United States Supreme Court) and for Judge Harry T. Edwards (United States Court of Appeals for the District of Columbia). While in law school, Ms. Deveney was the managing editor of the Michigan Law Review. United States Supreme Court, Washington, D.C., Judicial Clerk for Justice William J. Brennan, Jr.
How to Handle Joint Property, Institute of Continuing Legal Education, Speaker at and Moderator of day long seminar entitled "Annual Probate and Estate Planning"
"Proving the Deaths of Missing Persons"